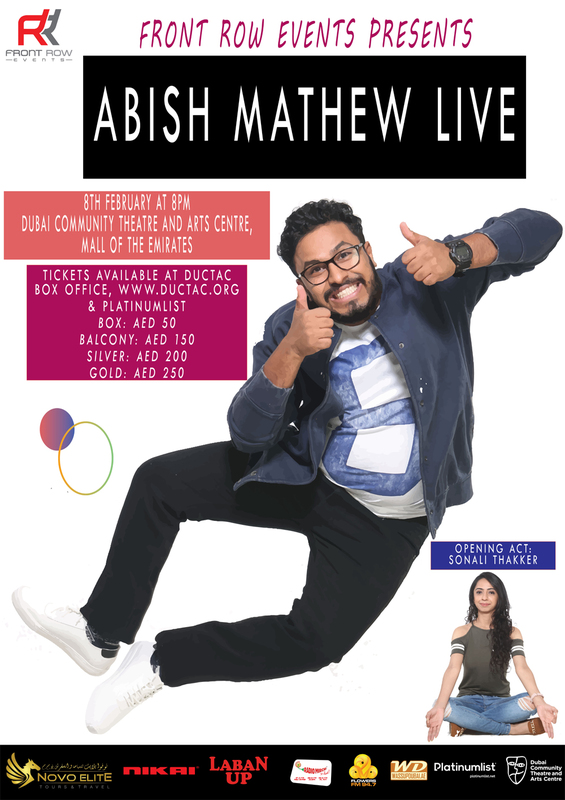 Catch the notorious "Son of Abish" star for his stand-up show on Thursday 8th February at DUCTAC, Mall of Emirates. Abish Mathew is one of the most experienced and unique comedians in the country. His performances are littered with funny original songs, silent enacted one man sketches, online shows, improv and stand up that keep his style of comedy fresh and thoroughly entertaining. Tickets priced at Aed 150 (Balcony), Aed 200 (Silver) & Aed 250 (Gold) and available at DUCTAC Box Office or get your online tickets from www.ductac.org or www.platinumlist.net .